faded a long time ago, as titans of the past; old world cuisine that has outdated itself. In my humble opinion, it’s time to re-embrace what they can do for us. Just to clarify, a compound butter is butter mixed with something. Anything. Mix butter with parsley and you’ve created parsley butter. Mix butter with roasted garlic and you have garlic butter. Garlic/sage butters are typical for prepping turkeys for Thanksgiving. Tomato butter, shrimp butter, citrus butter… you can make anything you want, but the trick is to make something with a specific purpose in mind. Citrus butter might be wonderful for finishing a seafood saute. Tomato butter might be great for finishing a pesto pasta dish. Shellfish butter for finishing your favorite scampi. They add richness and an abundance of flavor to so many dishes. Shellfish risotto finished with uni butter… heaven. Lobster and butter are one of those rare perfect matches that exist in this culinary world of ours. Lobster dipped in butter is standard fare at any lobster shack, and any additional flavor you add is welcome. For this particular dish, I’d like to highlight one of my favorite Asian citruses: Yuzu. Yuzu is native to southeast Asia, and is mostly associated with Japanese cuisine. It resembles a small grapefruit and the flavor is somewhat of a cross between a lime, bitter orange and grapefruit. It’s unique enough to be remarkable. Butter mixed with yuzu will be sweet, bursting with citrus flavor, and will have a slight Asian accept. Yuzu butter on grilled lobster is excellent and worth trying. And it’s easy. Try it with roasted Okinawa sweet potatoes, carrot and nappa cabbage slaw, grilled or pickled hom shimiji mushrooms, or any other great Asian side appropriate for grilling. Bring 1 gallon water to a boil in a large pot. Add the miso and sake and return to a boil. Put the lobsters in and return the water to a boil. As soon as it boils, turn the heat off and cover tightly. Let steep for 5 minutes. Remove the lobsters and plunge them into an ice bath. Let cool completely. Once cool, remove the tails from the bodies and crack down the middle (cutting down the underside with a high strength kitchen scissors is the best approach). Save the rest of the lobsters for other uses (lobster salad, bisque, etc). Once the tails are split, gently work out the meat, devein, and rinse off any roe from the meat. Gently work the meat back into the shell. In a mixer fitted with the paddle attachment, begin whipping the butter with the garlic at medium speed. Let the butter almost double in volume. Add the salt, zest and yuzu juice. Let incorporate completely. Transfer to a bowl and reserve. Heat a wood grill to medium heat. Let the coals go white and push them all to one side of the grill, leaving an indirect zone. Make sure the grates are clean and well oiled. 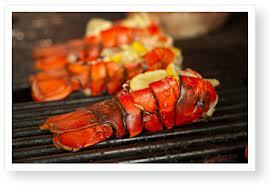 Place the lobster tails open side down on the grill and cook until lightly charred. Flip and spoon a liberal amount of yuzu button on top. Let the lobster tails cook through. Remove and serve with additional yuzu butter (melted) for dipping.